On December 11, in an overwhelming show of bipartisan support, the House of Representatives voted unanimously (398-0) to pass H.R. 3212: The Sean and David Goldman International Child Abduction Prevention and Return Act of 2013, authored by Rep. Chris Smith (NJ). This milestone was more than four years in the making and would not have been attained without Congressman Chris Smith’s hard work and dedication, and that of his entire staff. David Goldman, Mark DeAngelis and Melissa Capestro from the Bring Sean Home Foundation (BSHF) traveled to Washington, DC, for the day to lend support and celebrate the passage of the bill in the House. We recognize that there remain several critical steps to be completed before the bill becomes law. It is expected that the U.S. Senate will take up the bill early in 2014. All of us at BSHF remain optimistic that the bill will make its way to President Obama’s desk sometime in the coming year. 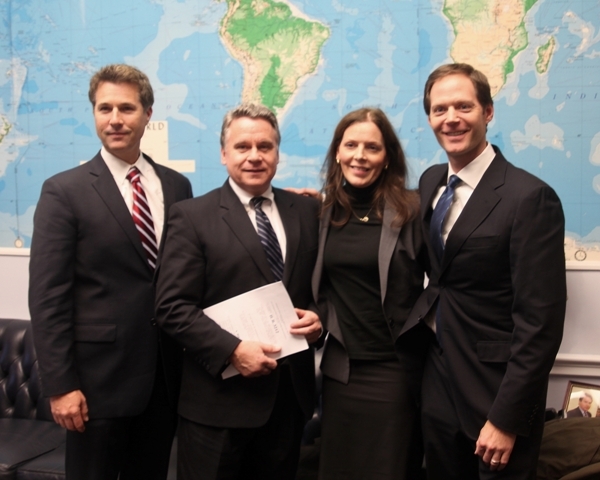 PICTURED: David Goldman (Co-Founder, BSHF), Congressman Chris Smith, Missy Capestro (Director, BSHF), Mark DeAngelis (Executive Director, BSHF) — in Washington, District of Columbia. Follow the Bring Sean Home Foundation on Facebook (http://www.facebook.com/BringSeanHome) and view additional photos from the day. NEPTUNE — It could be another Christmas surprise for David Goldman, the former Tinton Falls man whose son, Sean, was returned to him on Christmas Eve four years ago. This time, the gift would be the passage of a law named for Goldman and his son that would help other families whose children have been kidnapped to foreign countries. After three years of negotiations, the “Sean and David Goldman International Child Abduction Prevention and Return Act” is headed to the U.S. Senate, where it could be approved as soon as this week, said Rep. Chris Smith, who, along with Goldman, appeared at an editorial board meeting at the Asbury Park Press. Smith, R-N.J., said the Senate could take up the bill through unanimous consent, a procedure that would expedite the legislation’s path to President Barack Obama’s desk. Smith said he has not heard yet if Obama would sign the bill, but Goldman said Obama was supportive of his mission when he was a senator and intervened soon after becoming president. The legislation would set up a series of sanctions against countries that persistently fail to follow either the Hague Abduction Conventions, a 1980 international treaty that bars parents from fleeing to other countries until custody is decided, or similar agreements the United States would make with countries that haven’t signed on to that treaty. Sean Goldman, now 13, is the only U.S. child so far to be returned [from Brazil] under the Hague treaty, which is signed by more than 80 countries, but rarely is enforced. Children who have come home do so most often because of an agreement reached between both parents, not because of judicial orders by foreign courts, Goldman said. The sanctions, which range from the president making a private appeal to suspending or revoking economic aide, are key to the legislation, which Smith said amps up the Hague treaty by putting political pressure on countries that harbor parents. The law also would require the U.S. Department of State, with the parents’ permission, to notify federal lawmakers, who represent left-behind parents, of the abduction so they can put pressure on their diplomatic counterparts. The bill passed the House with a 398-0 vote, a seemingly impossible feat in the increasingly cantankerous Congress. Goldman, however, sees nothing partisan in bringing American children home to settle custody disputes. Goldman’s wife, Bruna Bianchi, took Sean, then 4, from New Jersey to Brazil on what Goldman thought was a two-week trip to visit family. Bianchi remarried, then died in childbirth, which set off the high-profile international fight to return Sean home. Goldman said cases like his, where the children have been living in the United States before one parent takes them abroad, are often wrongly characterized as international custody cases instead of abduction cases. But once abroad, the country harboring the parent abductor treat the case as a straight custodial case, where laws often aren’t the same as the United States. Goldman, 47, incurred upwards of $700,000 in debt for legal bills in both countries, plane tickets, extended hotel stays and translation costs in the fight to bring his son home from Brazil. This legislation would help reduce the financial damage families face along with emotional turmoil the separation case inflict by speeding up the children’s return to the United States, he said. “The quicker the remedy, the less the costs,” said Goldman, who established the Bring Sean Home Foundation to help other families. He has since moved from his Tinton Falls home, but has not said where he is living now. Goldman has remarried. Sean has visited with his Brazilian grandmother about three or four times since, at least twice in the past year, he said. Those visits occurred here with Sean’s therapist. The focus now has been to give Sean as normal of a childhood as possible, Goldman said. Goldman said he keeps a watchful eye on Sean as any parent would, but no longer fears when his son will be home. Given David Goldman’s well-chronicled five-year ordeal to be reunited with his son, who was abducted and taken to Brazil by his mother, it might seem odd to call him lucky. But considering how difficult it is for parents whose children were taken from them by a spouse or other family member to another country to succeed in having them returned, he is lucky indeed. Despite a 1980 international treaty that prohibits parents from fleeing to other countries until custody is decided, Sean is among a small minority of American children who have been returned under that treaty, the Hague Abduction Conventions, which lacks any enforcement provisions. That is why it is essential that the U.S. Senate approve a bill sponsored by Rep. Chris Smith, R-N.J., passed unanimously in the House last week, that would allow sanctions to be imposed against countries that show a pattern of illegally harboring abducted children. Smith played a major role in raising the national profile of Goldman’s case, and helped set the wheels in motion for Sean’s ultimate return to the United States. The threat of economic sanctions against Brazil also was a contributing factor. Sean, now 13, was caught up in a protracted legal battle after his mother took him, at age 4, to Brazil. She remarried, then died in childbirth. Her parents tried to win custody after she died. As Smith and Goldman told the Asbury Park Press editorial board on Monday, the bill essentially gives parents who have fought for the return of their children in abduction cases the full backing of the U.S. government. Instead of individuals having to deal with uncooperative countries on their own, the bill makes it a fairer fight. The bill not only gives the president a variety of measures he can employ against nations, but provides other tools that can be used to help reduce the number of abductions, now estimated at more than 1,000 a year in the U.S. alone, and to shorten the length of time the cases go unresolved. The bill would require the Secretary of State to submit an annual report on the status of abducted children and whether other countries are meeting their obligations to return them. It also would require our diplomatic and consular missions to designate someone to assist American parents whose abducted children are in their country. The legislation would set up a series of sanctions against countries that persistently fail to follow either the Hague Abduction Conventions or similar agreements the United States would make with countries that haven’t signed on to that treaty. Fittingly, the Smith bill is named the Sean and David Goldman International Child Abduction Prevention and Return Act of 2013. It serves as a tribute to the perseverance and fortitude of the Goldmans, both father and son, and to the tenacity and decency of Smith. The Goldman’s saga, which inspired the bill, should now be the inspiration for the Senate to follow the House’s lead in approving it, and for President Barack Obama to sign it into law.